A new tax ruling threatens to challenge a strategy that allowed thousands of businesses and professionals to reorganise themselves and attract foreign investors. This involved converting closely held companies into limited liability partnerships (LLPs) — a structure that was introduced a decade ago. While LLP was intended to help businesses to scale up, many were also allured by its ability to freely distribute profits to partners as dividend without deducting any dividend distribution tax. The new ruling would force many companies to change tack. 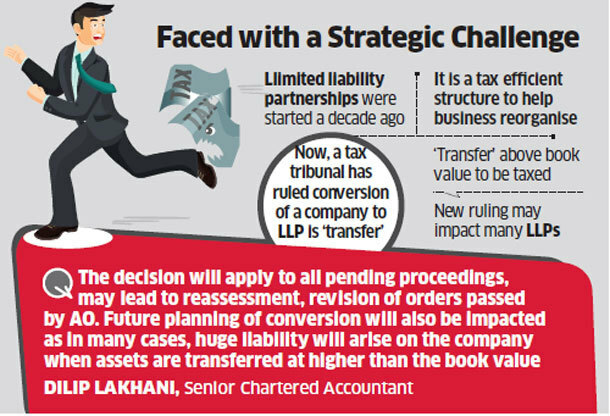 In mid-November, a Mumbai bench of the Income Tax Appellate Tribunal said conversion of a company into LLP is covered by the definition of ‘transfer’ and therefore liable to capital gains tax. There would be no capital gains tax, as per the tribunal, as long as such a transfer happened at book value. However, many businesses used to convert by valuing the assets higher than book value to strengthen balance sheet of the LLP, borrow funds, attract foreign capital, as well as increase the net worth of the partners in the LLP. Another significant aspect of the Tribunal ruling is that any tax that had escaped in the hands of the company would now be levied on the limited liability partnership, which is construed as the successor. “This could make life difficult for many LLPs,” said Lakhani. The ruling involved Celerity Power, a private limited company that acquired LLP status in September 2010. The tax office did not buy the company’s argument that the conversion of M/s Celerity Power Pvt Ltd into M/s Celerity Power LLP did not involve any transfer of property, assets or liabilities, among others. The ruling could also draw the attention of the indirect tax authorities, as it challenges an earlier Madras High Court ruling that no stamp duty is levied in case of conversion of a firm into a company. Smaller companies with less than Rs 60 lakh earnings are exempted from the definition of transfer (and thus, from capital gains tax). However, even companies with income above the threshold are currently in a position to avoid tax on the back of the Texspin verdict of the Bombay High Court, which said the conversion was not a transfer. The Income Tax Appellate Tribunal’s ruling on Celerity Power partly takes away that protection that companies enjoyed. Post ruling, tax can be avoided only as long as ‘transfer’ from a company to an LLP happens at not higher than the book value.